The week before Thanksgiving i was getting ready for a trip to visit my family that i have been so excited for all year. Of course i would not only get into a car accident, but they need a whole week to fix the bumper and hood. This is my luck, so fortunately i pre-booked my rental car on RentalCarMomma before they sold out for the busy holiday. I got the whole week with a Ford Focus for my trip for 178.00. I had room for all my luggage and was very comfortable so it worked out to my advantage in the end. I was headed for a small (one stop light) town right outside of Valdosta Georgia called Morven. You would think that the day before Thanksgiving people would be traveling and traffic would be a nightmare but it was not to bad on my 4 hour drive straight up 75. It was a very uneventful drive with a lot of built up anticipation for the feast the next day. My whole family lives there on the farm that we have had for as long as anyone can remember and thanksgiving is the best time of year for me because of my family's unusual traditions. We have 3 huge tables full of food and one full desert table that my grandma and her 8 brothers and sisters prepare for all of us (a ton of children and grandkids). I think about this food all year long! We have a couple turkeys that my brother collects off the farm and a ton of catfish from my dad in Okeechobee FL. We begin eating around noon and don't stop until late with some breaks in-between. After all the cousins and siblings are done eating the fun really begins. We set fire to a burn pile that my brother collects for all year and that is our "base". We all load up on the fourwheelers and dirtbikes and play hide and go seek on the 400 acres that isn't used for farming till we are to tired to play anymore. How is the game played? 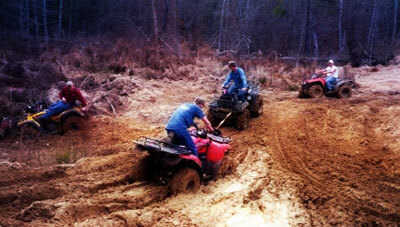 One person gets on the dirtbike and the rest are on fourwheelers. We then hide deep into the woods and wait to be found, or you can run from the person until he catches you. This is how my family spends thanksgiving night. The next morning all the boys get up and head for the woods and hunt until my grandma gets up and lets us all know breakfast is ready. She cooks enough food for an army but somehow it is always gone by 10 o clock am. Then the boys go clean the mornings catch and begin preparing that for dinner along with what ever the women decided to throw together. This goes on until Sunday morning when we all have to say goodbye until Easter. Luckily I found such a reasonable rental car on RentalCarMomma or i would have missed family tradition of Thanksgiving.